What fun it is to crochet a blanket for a new baby! This baby blanket is designed after the baby blanket that my mom loved to make! However, this blanket is much easier to crochet! My mom’s favorite baby blanket was worked in strips, but this blanket is worked in rows. My mom’s favorite baby blanket had over 250 ends to weave in, plus the strips had to be seamed together. This blanket has only 40 ends to weave in and no seaming! That’s a huge improvement! The pattern includes complete written instructions, as well as symbol crochet charts for right-handed and left-handed crocheters. There are 2 pdfs that you’ll receive with this pattern purchase. One has 14 pages with minimal photos. The other has 30 pages with over 90 step-by-step photos! You can choose which one you want to print out! 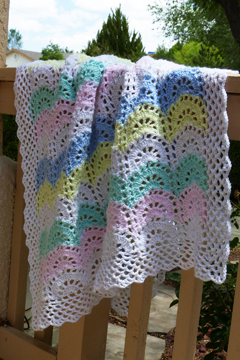 Use the colors shown or any colors you’d like to customize your baby blanket! Or use heavier yarn and a larger hook to make a full-size afghan instead! Note: Photographed model made with Loops & Threads Snuggly Wuggly yarn in #1005 White, #1420 Pink, #1230 Soft Mint, #1615 Soft Yellow and #1128 Pale Blue.